The Toyota C-HR crossover that could easily be mistaken for your childhood puppy—well, if the puppy had wheels—will now make its way to one of the fiercest endurance races around, the 2016 Nürburgring 24 Hours. No, really. With that, it looks like the crossover really did kill the car. Toyota GAZOO Racing announced its intention to field the C-HR Racing entry on Friday, and the car will be up against plenty of weathered endurance racers for the Nürburgring event in May—including its more traditional Lexus RC and RC F teammates. The manufacturer itself isn’t new to the Nürburgring. The GAZOO group began competing in the 24-hour event back in 2007, and Toyota consolidated GAZOO Racing, Toyota Racing and Lexus Racing under the “Toyota GAZOO Racing” name in 2015. According to the announcement, the C-HR Racing lineup for the Nürburgring includes Kumi Sato, Masahiko Kageyama and an unnamed driver. The C-HR first came around as a hybrid concept from the Paris Motor Show in 2014, and the race car is a slightly fiercer version of the original CUV resembling a puppy. 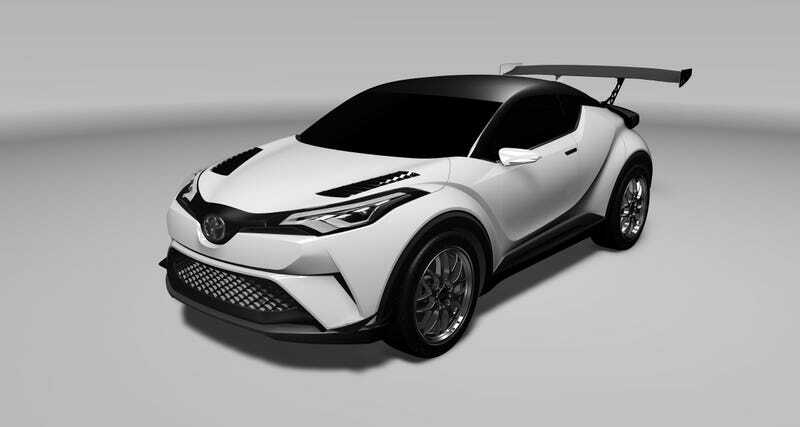 We don’t have any details about the C-HR Racing yet, but Toyota said it’s similar to the concept unveiled at the Frankfurt Motor Show in September. According to Autoblog, Toyota reportedly plans introduce the production version at the Geneva Motor Show and it will likely be a hybrid. The C-HR is expected to be on the market this year, and it will be sold as a Scion in the United States. As for the race version of the C-HR, Toyota partially dedicated its participation in the Nürburgring 24 Hours to the fact that commitment shown under harsh racing conditions “has a positive impression” on customers. We decided to take on the new challenge of creating ever-better cars using a crossover rather than a pure sports car [for the Nürburgring 24 Hours]. We want to accelerate the building of ever-better people and vehicles under the harsh and unique conditions of the Nürburgring, and apply these experiences to future vehicle development. It’s a bold move by Toyota, and the C-HR certainly won’t blend in with the field at the Nürburgring in a few months. It’ll be unique, but we’ll have wait and see if it’s fast—and if it can handle challenges that come with endurance racing.